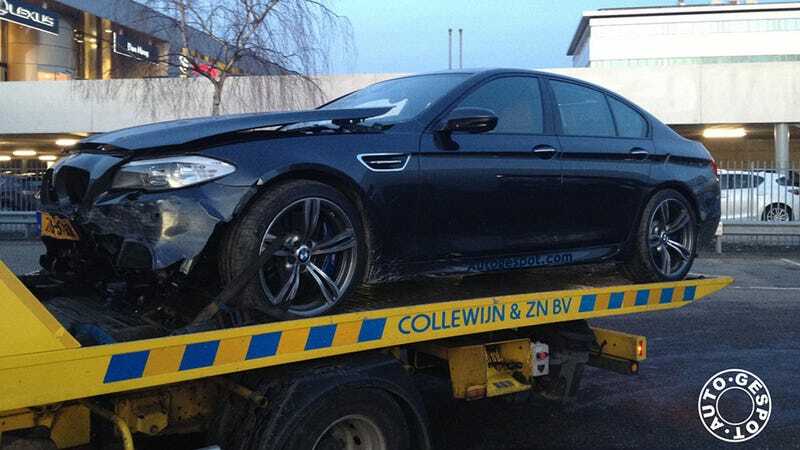 Proving that no one, not even the Germans, can defy physics, one of the very first2012 BMW M5s to reach customer hands has been wrecked. What's that about a body in motion? Especially a 4,300 Lbs, 560 HP body? No word on the circumstances of the accident, but since it's a BMW, we'll assume it involved talking on a cell phone while tailgating. Yes, try as hard as they might, even the Dutch succumb to stereotypical behavior. Damage in these AutoGespot photos initially appears limited to the front bumper and hood - consistent with a common rear ender of the kind caused by asshattery - but BimmerPost claims it sees some sort of "gash" along the side. If so, that likely indicated a spin or similar loss of control prior to the impact. Weather in Den Haag, the scene of the crash, is mild, but wet. Even equipped with every electronic nanny known to mankind, grip is still finite.